Our First CSU/DSU with QuikConnect™ Interface Modules! The Patton Model 2530 DigiLink V™ dedicated all-rate CSU/DSU is the latest in our line of standalone access products. The Model 2530 has all the features of Patton’s dedicated All-Rate CSU/DSU, plus compatibility with all of Patton’s QuikConnect™ DTE interface modules. 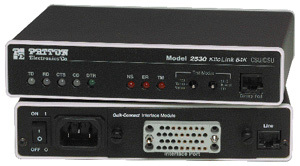 The Model 2530 lets WAN hardware such as routers, multiplexers and servers connect to 4-wire digital services such as DDS and 64 kbps Clear Channel™. Incorporating rate adaptation for both network and DTE interfaces, the Model 2530 boasts a full compliment of diagnostics: telco loops, V.54 compliant local and remote loop and a V.52 BER test pattern generator/receiver. The Model 2530 has eighteen easy-to-read front panel LED indicators (data, control signals, speeds, network, tests). The Model 2530 supports internal, external or receive recovered clocking, and operates in point-to-point or multipoint environments. Other important features include anti-streaming, auto equalization and externally accessible configuration switches. The Model 2530 operates sync or async, and can also be used in a point-to-point campus network. Power: 100-240 VAC, 50/60 Hz (universal input option); 12, 24, 48 VDC (option). 5 watts. Compliance: CE Marked per EMC Directive 89/336/EEC and Low Voltage Directive 73/23/EEC. UL and cUL Safety Approvals.